While the percentage of networks with 2-3 buildings has remained relatively stable, the number with just one building has increased to 40% from 33-35 percent in previous years, and the number with three or more buildings has decreased to 31%, lower than in any previous survey years. Although the average amount of total DC network square footage is on a downward trend, from 502,325 in 2014 to just 473,400 this year, the sweet spot for growth remains in the +/- 50,000 sq. ft. range, a category that has increased from 24% in 2014 to 29% in 2017. After slight increases in 2015-16 to +/- 30 feet, the average clear height of DC buildings now more closely approximates 2014 levels, in the high 20s. The number of annual inventory turns in warehouse operations decreased to an average of 8.5 in 2017, from 8.6, 9.1, and 9.2 in 2014-16, respectively, a trend that may indicate DCs are holding more inventory for longer than is optimal. 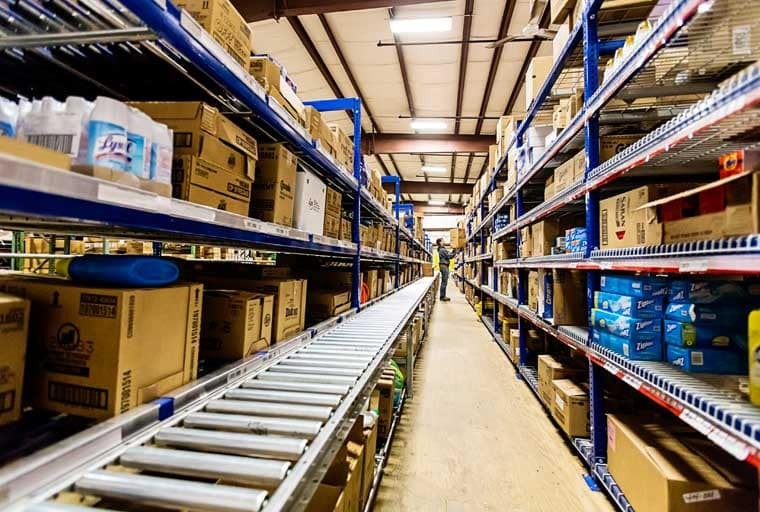 On average, the number of SKUs stocked is decreasing, from a high of 14,036 in 2015 to 13,130 in 2017, although significantly fewer of those SKUs are suitable for conveyable or robotic handling. Seventy-one percent of DC operators plan to expand (or consider expansion) in 2018, the largest number since 2014. The greatest percentage (36%) plan to increase the number of employees, and 29% plan to increase the number of SKUs. In contrast, less than a quarter plan to increase inventory turns, overall square footage or service areas. A significant majority of DCs are using conventional material handling systems for receiving (84%), picking (70%), and replenishment (62%) operations. While that number has remained fairly stable in receiving and replenishing, the percentage of DCs using conventional cart or lift truck picking has actually increased over the survey period. While 62% of DCs still use paper-based picking systems, nearly half of operations include RF-assisted/scan verification technologies. Parts-to-person, pick-to-light/scan verification and pick-to-voice (with and without scan verification) technologies are used in just 7-12% of operations in 2017, although those levels are a significant increase over the previous three years. Order-picking techniques in common use in 2017 include single-order picking (79%), batch picking (43%), cross-docking (30%) zone picking (27%), put-to-order (20%), and put-wall systems (4%), a distribution that has fluctuated little over the survey period. Inability to attract and retain a qualified hourly workforce is respondents most consistently cited issue again in 2017, followed by insufficient space (40%), which has typically occupied the number two spot across survey years. Experiencing these major issues yourself? UNEX can help you optimize your storage systems to free up extra space in your facility, and reduce workforce requirements by making picks faster and safer. Our Pickologists have the experience and know-how to help you to take your warehouse operations to the next level.